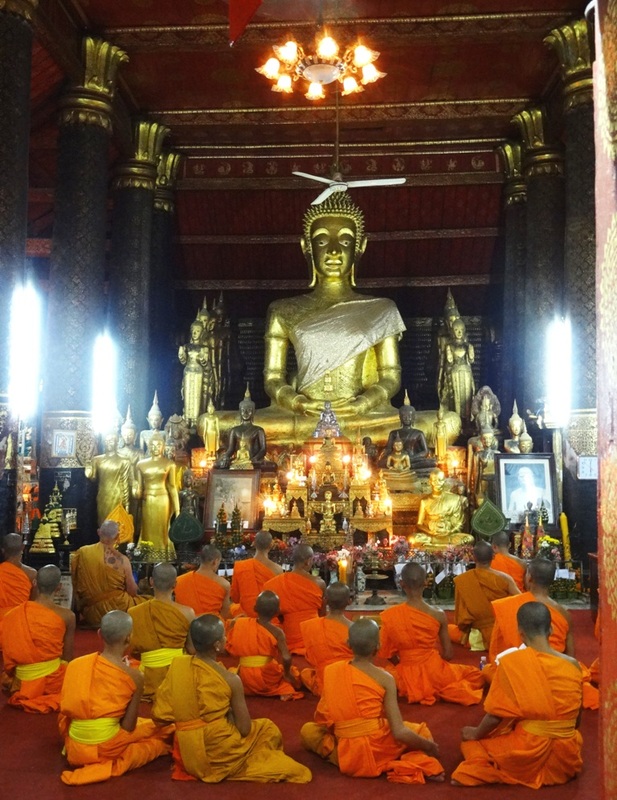 I have been attending evening chantings in temples since coming to Laos in August 2012. You could compare the chanting to a mass in Christian religion. 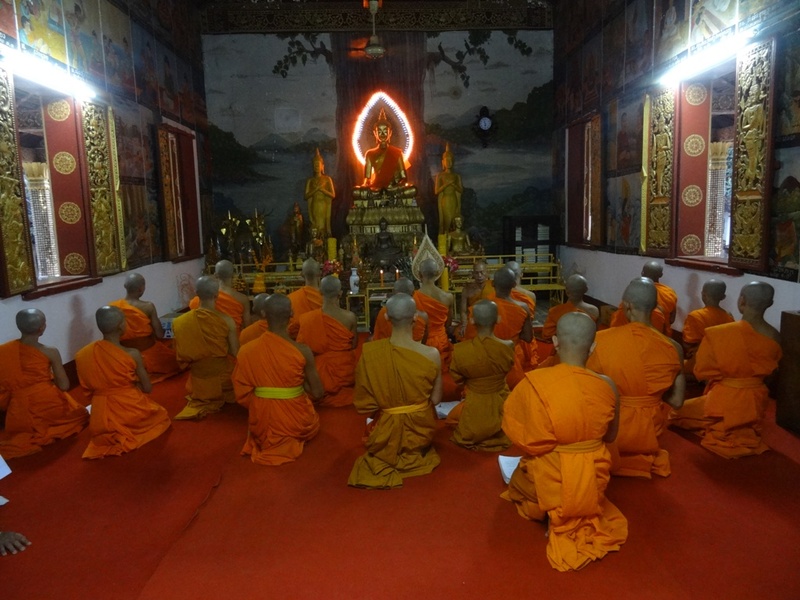 Every morning at 4 am and every evening around 5 pm the novices and monks in all temples pray to and worship Buddha (although some of the temples don’t chant in the mornings throughout the year, only during buddhist lent) . Since my trip to Nepal in 2008 I felt some kind of mystical attraction to temples, the temple inhabitants, walking around in their orange robes and the amazing sound when they hit the drums erly morning and late afternoons. I am surrounded by temples in Luang Prabang, there are approximately 84 temples in this little town – Wat Xieng Thong, one of the most beautiful temples is right next to my house, opposite of my house is Wat Killi with a nice library building and in the next street block I have 5 temples lined up next to each other. So on every buddhist holiday (which is quite frequently, e.g. on the 1st, the 7 and 8th, the 14 and 15 day of the lunar calendar) I am woken up at 4 am by the apocalyptic sound of the drums and symbals in the temples. I love it. a 5 past 4 I go back to sleep. When you wander through the streets of Luang Prabang around 5 pm you hear the monks’s and novices’ chanting resounding from the temples, all in different speeds, different pitches, and sometimes different words. When I walk home in the late afternoons I often lip-sync the words as I know about half of them by heart. My friend, exmonk Phan, had re-written a chanting book into latin letters (they call this “Karaoke”) so that I can sing along and actually read. 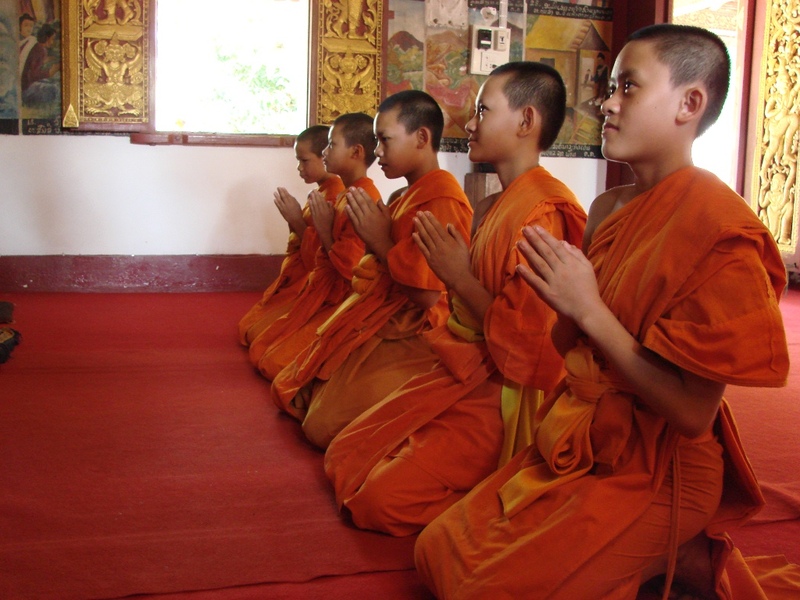 The language of the chanting is in Pali, a dead language, a language of many of the earliest extant Buddhist scriptures and the liturgical language of Theravada Buddhism. The locals use textbooks in Lao letters, I use my special book with latin characters. Every time I kneel down in the back of the temple next to local women they lok at me with curious eyes when I take my textbook out of my bag and they can’t grasp how I am capable of singing along in this language. The proper way to dress for women is traditional skirt – sinh – plus a blouse (preferably white) and a scarf. For men the dresscode is not that strict but they also wear a scarf during chanting. Upon entering the temple everyone must take their shoes off. The first obstacles were sitting a whole hour on your knees or on the side WITHOUT losing all senses in your limbs. It was hard training to get to where I am now, easily enduring 1 hour in this position (and it makes me giggle when I have friends visiting and I see them struggle and shuffle around from one hip to the other – just as I did 7 months ago). DO I understand the meaning of the words chanted in ancient Pali language? For the first time in God (or Buddha) knows how long I am doing something where I don’t question what I am dong or trying to understand every single bit of it. And I thoroughly enjoy that. This one hour gives me the opportunity to focus on something, to switch my brain off. And sometimes the vibes of the travelling sound of the chanting or the calm and peace during the short meditation breaks let me experience something wondeful: to be in the NOW. And upon leaving the temple there is always time for a little chat with one of the novices or monks, particularly when I go chanting at the temple where I teach. Posted by Brita Graser on 28. May 2013 in Laos 2012 and tagged buddhism, temples. Hi Brita. Very interesting blog post. 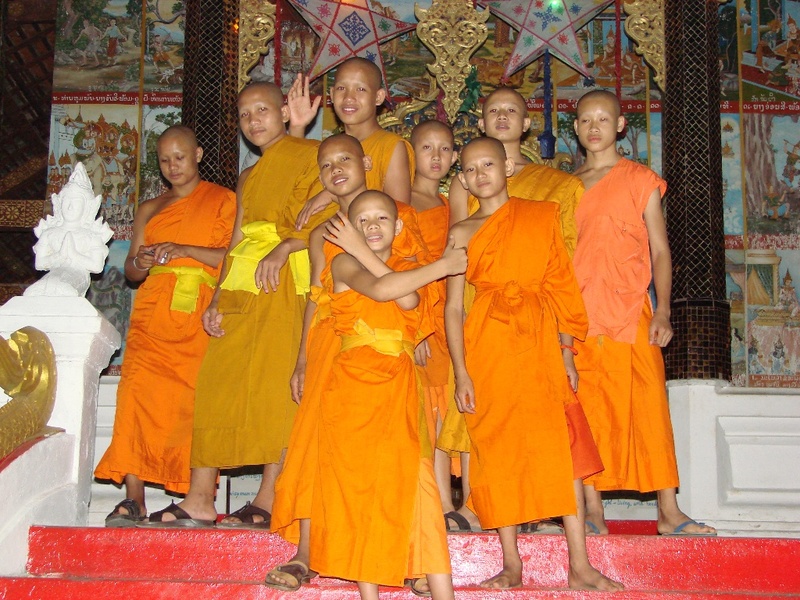 I did not have time to engage in the culture in Luang Prabang as much as you have, but I aim one day to be back. 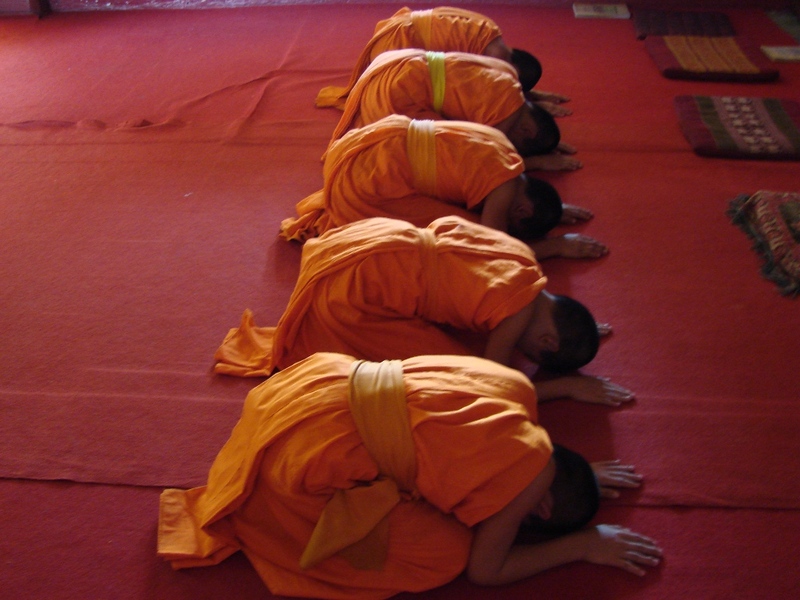 I want to know- do you think that Buddhism, or Catholicism, is closer to the truth? Or do you think they are both ‘different paths up the same mountain’?